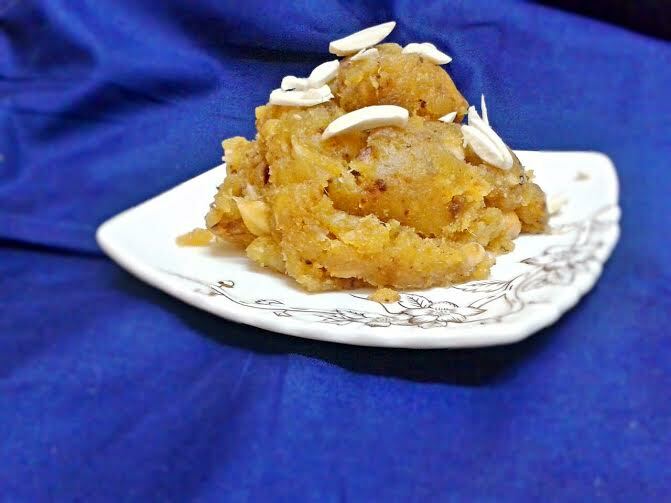 shakarkand halwa is easy and quick dessert. 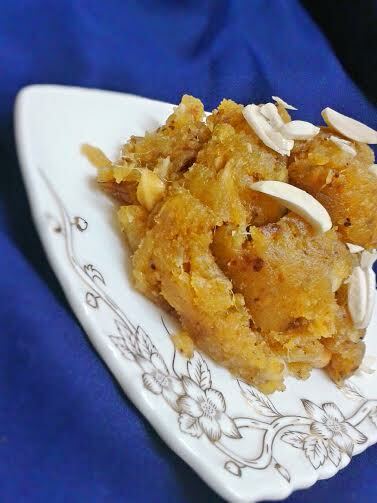 Made with boiled and mashed sweet potato, sugar, ghee and nuts, flavored with cardamom powder. Sweet potato 2 large nos. Chopped nuts 1 tsp for garnish . Take the sweet potato into the pressure cooker with enough water, boil for 8 to 10 minutes. Once sweet potato is cool peel the skin and mashed or grate them fine. Heat the ghee in a heavy bottom kadhahi or non stick pan, fry mashed sweet potato and cook with stirring occasionally until ghee begins to separate. Add sugar, cardamom powder and nuts, mix well, keep stirring and cook the Halwa for 2-3 minutes. Turn off the heat, transfer into a serving bowl, garnish with nuts. NOTE--- The Halwa tastes better when fried well.